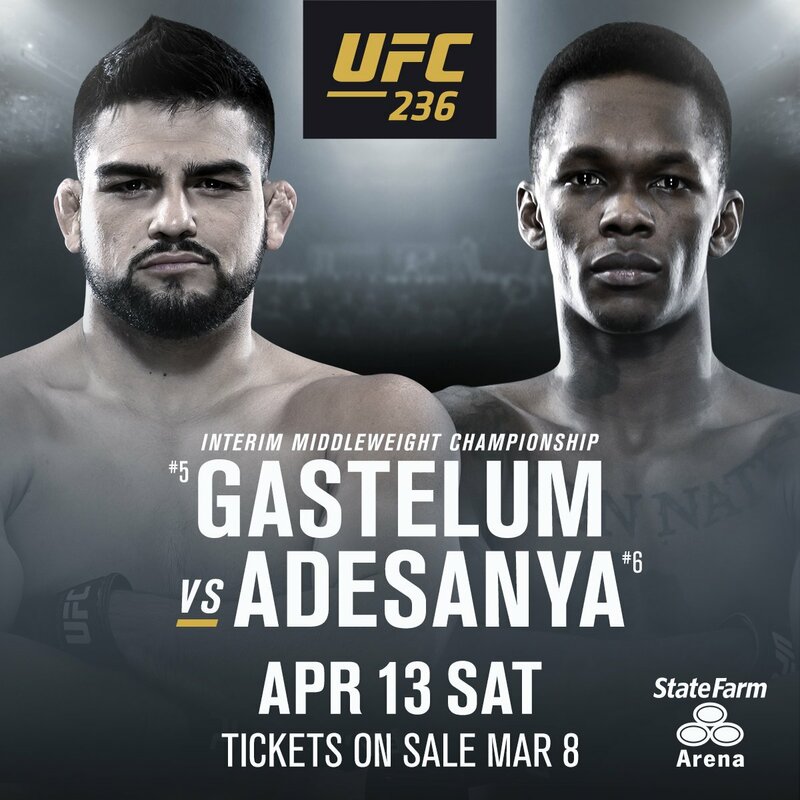 UFC 236 takes places Saturday night live from the State Farm Arena in Atlanta, Georgia, and will be headlined by two interim-championship fights that will have major implications for the winners. UFC Middleweight Champion, Robert Whittaker, is still out of action due to an emergency surgery that was required prior to his scheduled bout with Israel Adesanya at UFC 234 and UFC Lightweight Champion, Khabib Nurmagomedov is currently serving his suspension for his role in the post-fight brawl at UFC 229, after he submitted Conor McGregor. The main event will see UFC Featherweight Champion, Max “Blessed” Poirier take on Dustin “The Diamond” Poirier in a rematch of their featherweight bout at UFC 143, where Poirier submitted Holloway with an armbar in the first round. They were two up-and-coming fighters when they last fought, so there’ll be extra motivation in this fight because both will want to prove that the first wasn’t a fluke. Holloway and Poirier were very young the last time they fought; Holloway was 21-years of age and Poirier was 23-years of age, and since then, both have gone on to become one of the top fighters in the world in their respective weight classes and built an impressive legacy for themselves in the sport. Holloway is coming into this fight on an eleven-fight win streak that includes impressive wins over Jeremy Stephens, Cub Swanson, Anthony Pettis, Jose Aldo twice, and Brian Ortega. After defeating Ortega in a one-sided fight, UFC President, Dana White, stated that he felt Holloway should move up to 155lbs because there would be great matchups for him, and he may even be better at a heavier weight-class. Poirier is coming into this fight with an impressive streak of his own. In his last three fights, Poirier has finished top lightweights including: Anthony Pettis by submission, Justin Gaethje by TKO, and Eddie Alvarez by TKO, all of whom have become Lightweight Champion in the UFC or other promotions at some point in their careers. Even though Poirier won the first fight, I feel as though Holloway has the slight advantage in this fight and will be able to add another championship to his resume. Fans almost got to see Holloway vs Khabib last year when Holloway stepped in on short-notice but the fight didn’t end up taking place because Holloway couldn’t cut the extra weight in time. The winner of the fight is likely to fight Khabib for the UFC Lightweight Championship this September in Abu Dhabi. Kelvin Gastelum vs Israel Adesanya is another intriguing fight that’ll also be for an interim championship. At UFC 234, Gastelum was supposed to challenge Robert Whittaker for the UFC Middleweight Championship however on the day of the fight, it was announced that Whittaker was forced to pull out of the fight because he needed emergency surgery. As a result of Whittaker vs Gastelum being cancelled, Israel Adesanya vs Anderson Silva became the new main event as well as a number one contender fight. Adesanya was able remain undefeated in MMA by defeating Silva by unanimous decision in an entertaining fight that put his skills on full display. After the fight, Adesanya made a case as to why he should fight for the title instead of Gastelum, which led to the promotion setting up Gastelum vs Adesanya for the Interim-UFC Middleweight Championship, with the winner fighting Whittaker when he returns. This fight is interesting timing for Gastelum in that he defeated Uriah Hall to win The Ultimate Fighter in a fight that he was viewed as the underdog, so it would be a great moment for him if he could become the interim-Middleweight Champion six-years later under similar circumstances. Gastelum will have use his wrestling and close the distance if he wants to have success against a superior striker in Adesanya. For Adesanya, he’ll have more success if he keeps the fight standing because his unorthodox movements have shown to be a problem against his opponents and a skillset that has separated him from other top fighters in the division. I believe that if Adesanya has a similar performance in this fight like he did against Silva, he’ll be able to walk out of State Farm Arena with a championship around his waist. Even though the winner is expected to fight Whittaker for the UFC Middleweight Championship, I think Adesanya may have other plans if he wins the fight. This past week, Adesanya and UFC Light-Heavyweight Champion, Jon Jones had a little bit of a back-and-forth through the media after Adesanya said that he already beat one G.O.A.T and that he was hunting the next referring to Jones. A win for Adesanya may lead him to moving up to 205lbs and challenging Jon Jones for the Light-Heavyweight Championship instead, if Jones successfully retains against Thiago Santos in July.